Firing on All Cylinders or The Last Hoorah? After nearly a decade of the equity markets climbing the wall of worry, it seems that pundits and economists are nearly unanimous in their belief that the bull market is strong and will last well into 2019. It’s true that we still have relatively low interest rates, high corporate profitability and low unemployment. Consumer confidence, small business confidence and business activity continued to be strong during June. Even the CITI Global Surprise Index rebounded, reporting positive data points in Spain, the UK, Germany and the Eurozone Composite last week. So, not only does the US economy look strong, but the future seems to be looking brighter for Europe as well. I have been trading for almost 50 years, and I can tell you for sure that the market almost always looks the best at the top. The chart above shows that the stock market is being pushed to a new record high by investors that are borrowing a record amount of money. Warren Buffett famously said the secret to be a successful stock trader was “Be fearful when others are greedy, and greedy when other are fearful.” It seems that no one is very fearful. The VIX or “fear index” set a new low this week since the high of 50 in February. The index now is roughly 5 points from its all-time low of 8.56 set in November 2017. The second half of 2018 will be a test of the extraordinary policies of the Fed over the last decade. Almost all of the historic run up in the stock market was the direct result of the easy money quantitative easing policies of the Fed. Every $1.15 Fed purchases resulted in $1 of S&P growth. Here is the problem. While the expansion of the Fed balance sheet was highly correlated to the surge in equity prices, it did very little to increase GDP. It required $9.34 in Fed purchases to increase GDP growth by $1. The increase in equity prices was primarily due to artificially low interest rates which created the opportunity for corporate buy-backs. Now, not only are interest rates being forced higher but The Fed is allowing their balance sheet to “mature”. It is sucking liquidity out of the market. The liquidation of the Fed balance sheet will increase in July and again in October. To make the situation even more tenuous the ECB plans to sharply reduce its quantitative easing program in October. There has been much discussion of the low U.S. unemployment rate and how critical it is critical to economic growth. Not only have unemployment claims dropped precipitously, but job creation since 2016 has produce quality jobs that provide a sustainable living wage above the poverty level. I caution investors to take note of jobless claims closely over the next six months. The U.S. is becoming late in the employment cycle. Historically, when the level of low jobless claims that currently exist, start turning higher, forewarning of a recession has followed every time since 1968. A closer look at the stunning run up of the stock market, fueled by a US economy “firing on all cylinders” reveals more beneath the surface. Since the 2009 recessionary lows, corporate profitability has largely benefited from cost cutting measures and accounting procedures enabled by Dodd-Frank regulations. There has been huge growth despite a lack of revenue growth. The reported earnings per share of corporations has increased 336% between 2009 and mid-2018. “This is the sharpest post-recession rise in reported EPS in history. However, that sharp increase in earnings did not come from revenue, which has only increased by a marginal 49% during the same period. Ultimately, the problem with cost-cutting and stock buybacks along with a myriad of accounting gimmicks is that there is a finite limit to their effectiveness. Eventually you simply run out of people to fire, costs to cut and the ability to reduce labor costs.” Source: Lance Roberts-Real Investment Advice, June 2018. Corporations have not shared the substantial profits they have generated with their employees. Quite the contrary, the wages of non-supervisory employees, which makes up 83% of the work force, have actually decreased since 2000. That is unsustainable. Higher wages create more disposable income which supports an increase in GDP. But with stagnant wage growth, GDP has had a hard time staying over 2% during this entire financially engineered bull market in stocks. This has created an historic gap between corporate profitability and GDP. 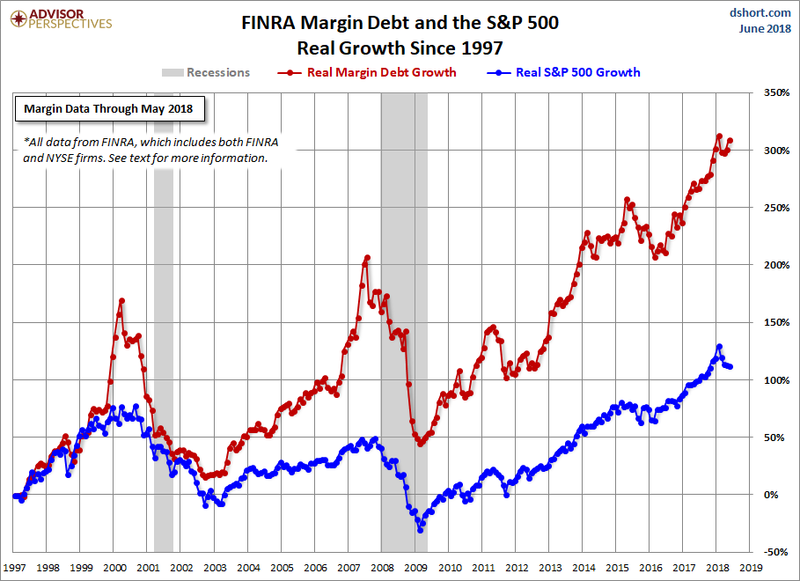 The chart at the top clearly shows that margin debt, now at its highest level in history, has fueled the stock market as well as the high yield bond market. When highly leveraged markets turn, they can do so with a vengeance, which in turn leads to margin calls, creating forced liquidation, which generates more margin calls. High yield bonds have very little premium over quality investment grade corporate bonds or U.S. treasuries at the moment. Keep in mind that many corporate bonds are BBB rated which is one step up from junk status. Owning higher yielding paper seems to be a very risky strategy right now. I believe that you can stay fully invested in the stock market provided you have 20% of your investment capital in a diversified trend-following managed futures program. This is the only asset class that made money in 2008. 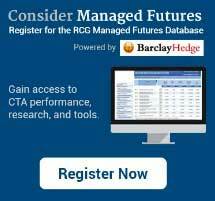 Though as always, past performance of managed futures is not indicative of future results and no guarantee to protect you from losses. Be careful following the herd. If you do, you may find yourself trampled when it turns. Will Headwinds Dampen 2019 Economy After a Strong 2018?